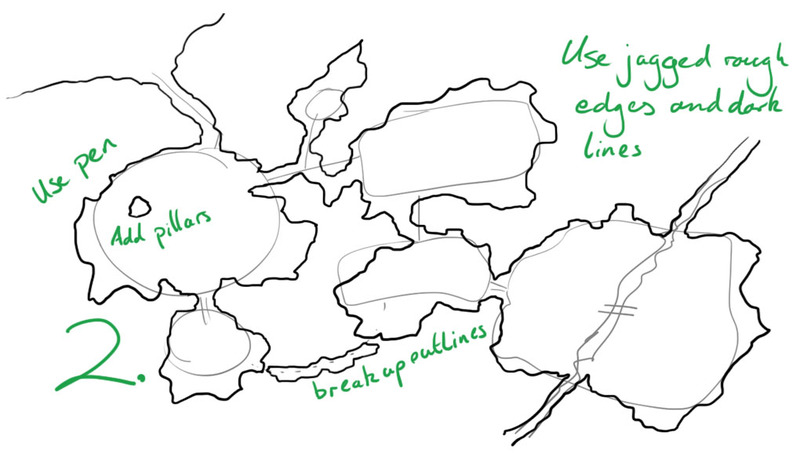 This is a quick tutorial covering the steps I take when laying out and drawing a cave map. Dungeons are flow charts. Use simple shapes to figure out where players come in, where they go, how they can bypass certain obstacles, and choke points they need to go through. Don’t worry about pretty at this stage, and use pencil. You should be sketching and changing a lot. This is mapmaking as adventure design. This can take 5 minutes or this can take days. You know where the walls are now so you can go in with pen and layout jagged dungeon walls. Break up the shapes from before – turn the caves into odd shapes. Never let your pen fly along the edge of the cavern, make it walk like a drunken sailor, creating a meandering jagged line. When we see a hard line designating a wall, we mentally visualise a vertical wall and a horizontal floor. That’s not true in caves – so I add details along the wall edge to show the rough jagged transition of an organic cave into the floor. 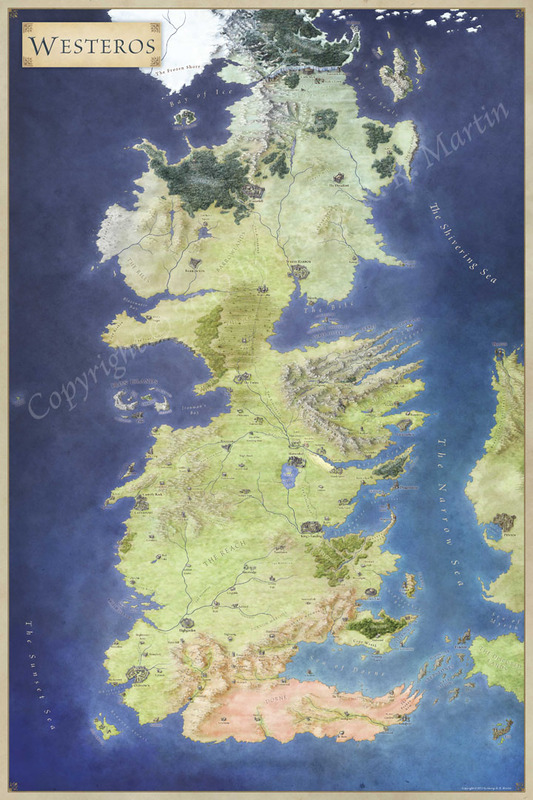 For built maps I’d add the detail in the wall instead, because you want that visual cue of a clean corner, but not here. Great tutorial! Thanks a lot! 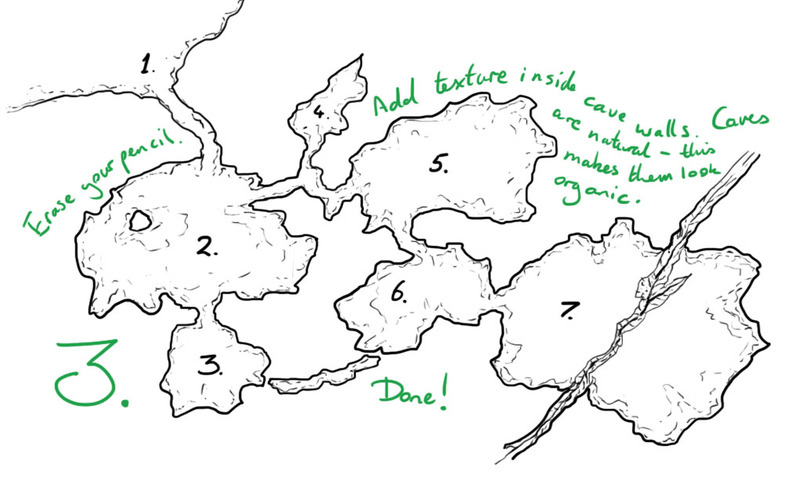 Very helpful, now I’ve started drawing caverns! Very nice! What are the dotted outlines? Secret passage sections? That works really well. Nice use of Charlemagne too – I love that font. I used the dotted lines for a lower level. Any suggestions on how to do a multi-leveled cave? I can pull off one level no problem. But I have plans to do one with at least 4. Never tried that before. Sorry for the late reply. Are all the levels visible on the same map? If drawing a multi-level map it may be worth drawing a floor plan for each level, such as the above tutorial depicts, in conjunction with a section/elevation drawing, showing a cutaway of the cave from top to bottom. That way you can equate a top-down view with a side-on view at different points. Another option it to do as is done in video games, and indicate where the level changes, i.e. slopes or stairs with a note saying “To lower level” or “to Level B2”. Overlay the location of the slopes/stairs and build around them to ensure cohesive and uniform position for where the levels change. The maps in Xenoblade Chronicles carried this out well, with darker/brighter shades indicating a change in level along a path. Hey Jon. This has actually helped re-evaluate and confirmed some of what I am doing already for a particular short adventure I am aiming to publish. Thanks!